Let's Hear It for Project Colonial Beach! John Drew and the crew that make up the all-volunteer Project Colonial Beach have done (and continue to do!) 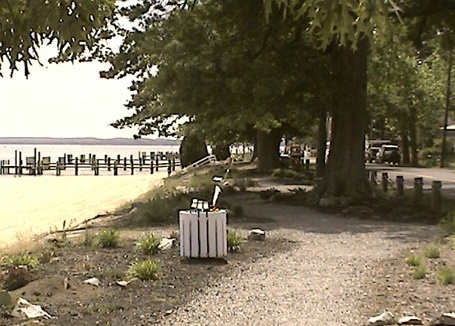 a great job in and around the beach with clean-up, landscaping and beautification projects. Formed in the summer of 2007 from a group of eight citizens mostly residing on "the Point" area of Colonial Beach, they quickly grew to a larger crew. Their website, which was formerly located at http://projectcolonialbeach.spaces.live.com has great shots of Hurricane Isabel, the YMCA Triathlon, construction of the RiverWalk and boardwalk beautification projects. The group also concentrates on the maintenance and upkeep of the war memorial at the corner of Irving and Boundary. Let's give a big round of applause to this group for all their hard work. They're really doing a great job of keeping Colonial Beach looking fantastic! If you'd like to volunteer your time with this fine organization, you can get in touch with them by sending an e-mail to ProjectColonialBeach@live.com or phone 804-224-4151.
for details on when the next one will be held. Typically a fundraiser will be held in May of each year, usually Memorial Day weekend, and this consists of a benefit concert at the stage on Town Hill. The May 24, 2008 event raised over $7,000! Their 2nd Annual Benefit Concert was held on May 23, 2009 and the 3rd Annual was held on May 29, 2010. There was a "Cash for Gold" program on June 9, 2010 in which people could sell their unwanted or broken gold jewelry for cash and the proceeds from that went to benefit Project Colonial Beach. What a great way to kick-off the summer season!